This week marks the July 4th holiday in the U.S., which means family gatherings, outdoor picnics, firework celebrations, and, most of all, ice cream! This delicious treat became more and more common at the turn of the 19th century when the method of transporting and storing great big blocks of ice over long distances became economically feasible. Ice cream was expensive (vulgar economy). We know our Miss Jane counted her pennies and did not live a life of extravagance, thus her tart observation. Edward spared no expenses in giving his family this luxurious dessert. Treating guests to ices in July during an era without electricity meant that Edward’s estate must have had an ice house to keep the ice frozen. The ice used for Edward’s ices most likely came via a variety of routes – local frozen ponds, rivers, or lakes in winter, or enormous blocks harvested in Norway or Canada, which were then shipped to the UK and transported by barge up canals to their final destinations – The Sweet Things in Life, Number One London Net. There were many forms of ice houses and ways to keep ice frozen, such as in the one I described in a previous post, 1790 Ice House, Hampton Mansion, and the one at Tapeley Park (see image below). Ice houses provided a dark, cool spot that preserved enough of the precious commodity to last until the next frost or ice block delivery. The 18th century ice house at Tapeley Park, U.K. is above ground. 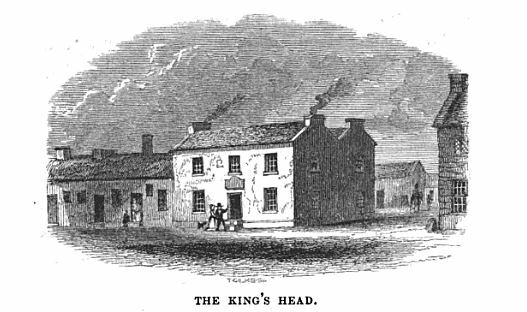 Image from Wikimedia Commons. After chopping and shaving huge blocks of ice, making ice cream was rather simple: Use a recipe you love. Fill a bucket with ice. Add ice cream ingredient to a second, smaller bucket and place it inside the larger bucket. Add salt to the ice, and stir regularly. Voila! Liquid is turned solid. Serve immediately before your creation melts. When I was in my 20’s, my then husband and I used an old-fashioned ice-maker to make the most delicious peach ice cream with the fruit in season. Our ice cream took longer to make, simply because we used more sugar than the Georgian recipes. We cranked and cranked that ice seemingly forever, but it was worth the trouble. When we had company, there was never enough to go around. Recalling how hot summers were without air conditioning, one can only imagine how refreshing it must have felt to eat something ice cold on a summer’s day in an era with no electricity and when people wore layers and layers of clothing. Thomas Jefferson’s handwritten recipe for making vanilla ice cream @ Open Culture. According to Monticello.org, ice cream began appearing in French cookbooks starting in the late 17th century. Tomorrow, on July 4th, you can be sure I’ll celebrate with a delicious bowl of ice cream. My favorite is still peach ice cream, followed by vanilla, and peppermint in the winter. Inquiring readers, ‘Pride and Prejudice and Zombies,’ the movie, has finally arrived. Almost seven years ago I had a blast reviewing Seth Grahame-Smith’s audacious novel, ‘Pride and Prejudice and Zombies’, and suggested a few satirical book plots of my own. Click here to read JAW’s review of Seth’s tome, which retained 15% of Jane Austen’s words and embellished Jane’s plot a wee bit by adding hordes of ravenous zombies that had overrun Regency England. For those who are eager to see the cinematic version of ‘Pride and Prejudice’ melded with Shaun of the Dead, may we suggest that you read the parody book before viewing the movie? Quirk Books has asked me to recall some of my favorite scenes from the book. I invited my good friend, Hillary Major, to trip down memory lane with me. She had read Seth’s book front to back in 2007 and recently reacquainted herself with the plot by way of a fabulous graphic novel based on the book. 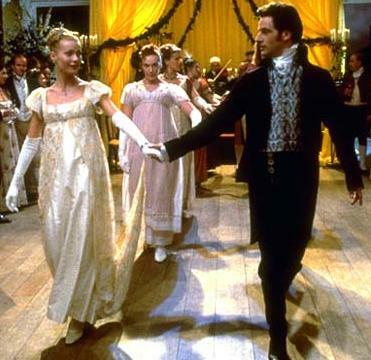 When I first read Pride and Prejudice and Zombies, I was struck by the wit – the humorous juxtaposition of Austen’s words with Graham-Smith’s pulpy additions, as when Miss Bingley asserts that an accomplished woman “must have a thorough knowledge of music, singing, dancing and the modern languages” as well as being “well trained in the fighting styles of the Kyoto masters and the tactics and weaponry of modern Europe.” As I re-familiarized myself by reading the graphic novel version of the book, I found much of the wit retained through the dialogue and (infrequent) captions. The graphic novel, of course, fleshes out the combat scenes and does a particularly good job of capturing the sorry stricken – from the former residents of Mrs. Beecham’s Home for Orphans to lamp oil salesgirl Penny McGregor to an undead Madonna and a certain longsuffering bride. The graphic novel pulls out the fun and the horror in the action sequences but also raises my curiosity about how the movie will put these scenes into motion. But really, how interesting are zombies as villains? What’s their motivation? Yes, yes, I know, it’s a truth universally acknowledged: brains and more brains. Still, there’s a certain sameness and routine to a zombie enemy. Zombies are really only dangerous in numbers – unless you happen to be an unfortunate messenger or a cook, which Lizzie Bennet most emphatically is not. My favorite parts of the book (and graphic novel) jump out not because of how they deal with the scourge of unmentionables but because of the way they showcase Lizzie as a total badass, armed not just with rapier wit but with actual dagger and katana. But Elizabeth Bennet is a warrior worthy of an enemy greater than brainless zombies – thus, we meet Lady Catherine, commander of ninjas. Lady Catherine de Bourgh has always put the cat in catfight, and this comes to literal life in her final confrontation with Lizzie. Who hasn’t applauded Lizzie’s refusal to promise never to become betrothed to Darcy and wished the statement were punctuated by a punch in the Lady’s face? Here, the verbal showdown is prequel to a martial arts battle, one that takes place in the Bennets’ own dojo. Lady Catherine gets in a few good blows early on, but Lizzie comes back with a dagger thrust, and soon Lady Catherine is flying through the air, breaking rafters. In the midst of all the “flying about” in a leaping, kicking, katana-wielding martial arts fantasy of a fight, Lizzie descends (from an unbroken rafter) at a key moment and batters away her adversary’s sword, leaving Lady Catherine at her mercy. Lizzie lets her live, knowing she has been “bested by a girl for whom [she has] no regard,” showing more mercy than Catherine would have offered her (or than Lizzie shows the ninja retainers). It’s this throwdown and victory over Lady Catherine that truly sets up the ending of Pride and Prejudice and Zombies, of Lizzie and Darcy fighting side by side. For my part, gentle readers, I shall never forget how Charlotte Collins, nee Lucas, slowly turned into a zombie after being bitten by a ghoul. Lizzie promised to remain true to her friend, but as the poor woman’s physical condition deteriorated, it was hard for visitors not to notice her unfortunate appearance or the fact that she was wont to nibble on her hand. One really has to laugh at some of the more ridiculous scenes and one can’t help but wonder how the exuberant young Jane Austen, who wrote the ‘Juvenilia,’ would have reacted to this mashup of her most famous novel. The powers that be in Hollywood took seven years to find a Lizzie (Lily James) and Darcy (Sam Riley) worthy of becoming skilled zombie fighters trained by the finest masters in the martial arts. To my way of thinking, Lena Heady’s turn in playing Lady Catherine de Bourgh with an eye patch is worth the price of admission alone. While I understand that many Jane Austen fans will refuse to see the film, some of us in our Janeite group can’t wait to see it. Love or hate the idea, feel free to let us know your thoughts. 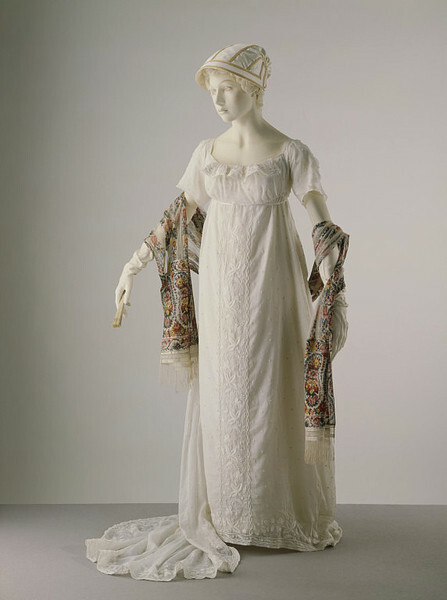 During the late 18th century, early 19th century, trains on gowns were de rigueur. 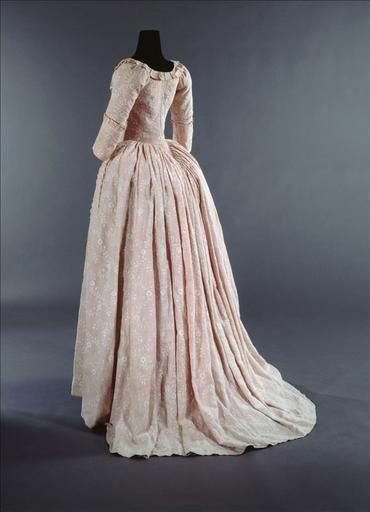 I chose to show the two gowns below, since the styles were popular when Jane Austen was a teenager (first image) and wrote the first editions of Northanger Abbey, Sense and Sensibility, and Pride and Prejudice (second and third images). 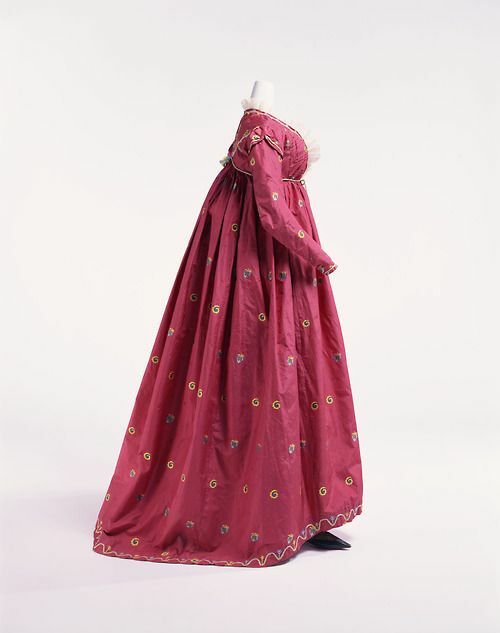 As Regency styles evolved and the 19th century progressed, trains were worn largely on evening dresses. 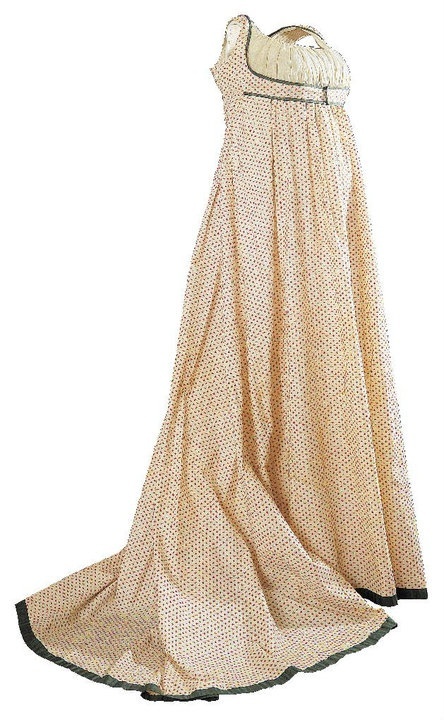 I have often wondered how delicate muslin gowns survived the harsh laundering that was required to remove stains made from dusty floors and muddy pathways. Even the grandest ladies wearing the most expensive dresses promenaded on gravel walkways or shopped along city or village streets. 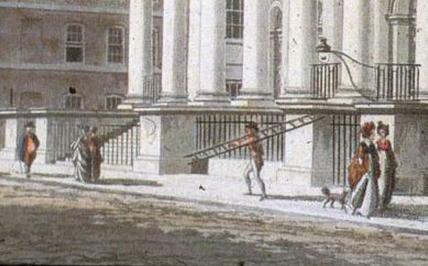 How did they manage to keep their hems clean in an era when paved roads and sidewalks were almost impossible to find? 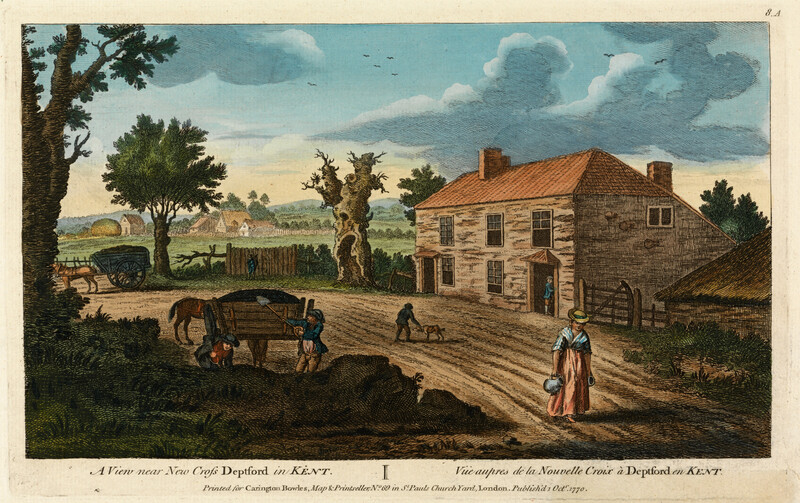 Dirt road, a view near New Cross Deptford in Kent, 1770. artist unknown Yale University, Mellon Collection. 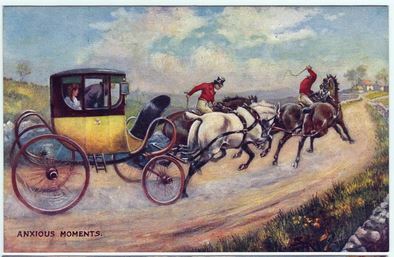 Until macadam roads became widespread, roads across most of Great Britain remained unpaved. 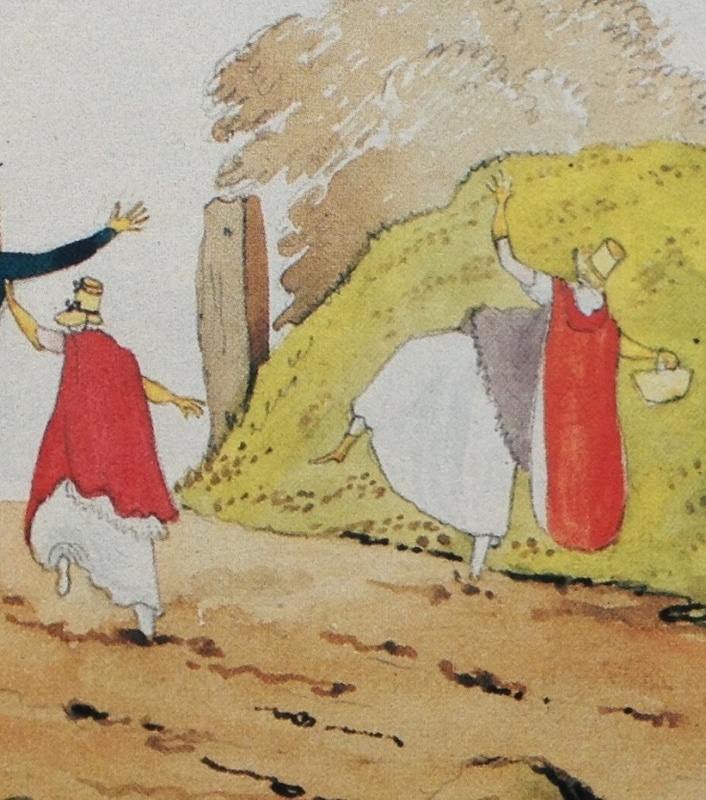 Village roads were especially notorious for becoming muddy quagmires during rainy days. 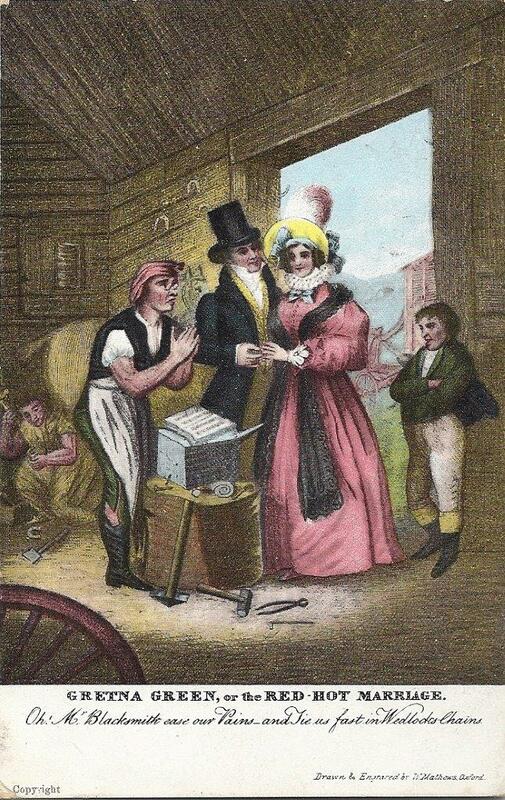 The deep ruts in this village scene, illustrated just five years before Jane Austen’s birth, say it all. Dresses worn by working class women stopped at or above the ankles, and for good reason! These women wore sturdy leather shoes that could withstand the dirt. 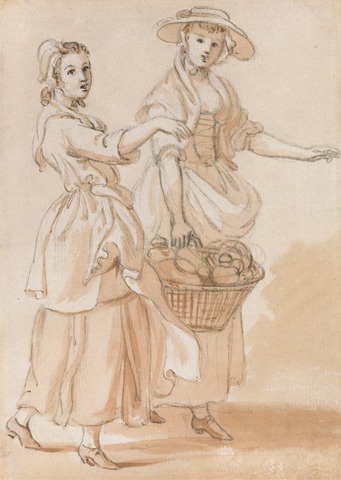 Paul Sandby drawing of two vendors, 18th c.
City streets were barely better than country roads. While sidewalks protected dress hems, roads were still made of dirt. People tossed out garbage from their windows, and horse droppings made crossings all but impassible for pedestrians. Crossing sweepers were stationed along major intersections, sweeping a clearing for anyone willing to give a tip. Not only did horses pull carriages and wagons, but drovers led animals to market through village and city streets. The stench from their droppings must have been unbelievable. This enterprising street sweeper places a wheeled plank at strategic points to help pedestrians cross dirty roads. Print by Carle Vernet. 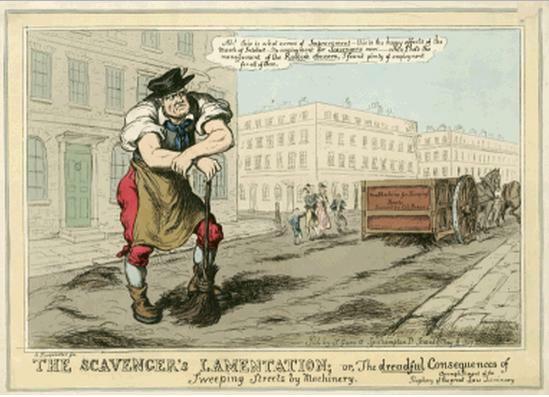 By 1829, machines began to replace manual labor, as this unhappy street sweeper notes in “The Scavenger’s Lamentation.” Observe the piles of horse and animal dung left behind. 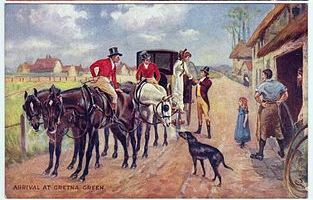 Jane Austen mentioned wearing pattens when she lived in Steventon. 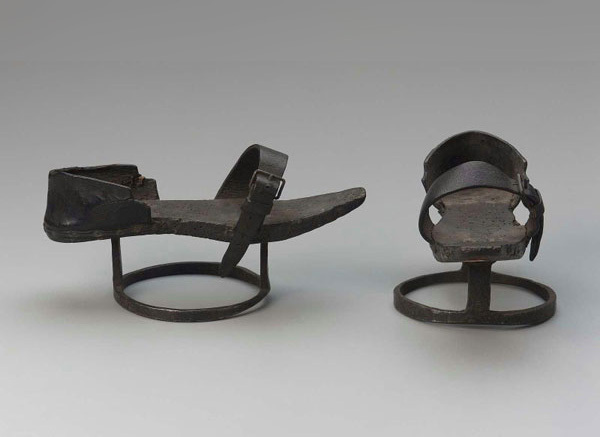 These devices elevated shoes above the dirt, but by the turn of the 19th century, pattens were no longer considered fashionable and were largely worn by the working classes, such as the midwife below. 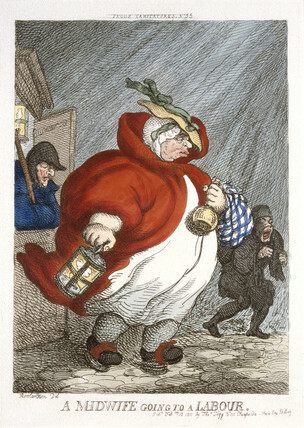 Rowlandson. AMidwife Going to a Labour. I always view contemporary images for clues. Diana Sperling created some wonderful watercolours around the topic. In this painting, you can see how the trains of the dresses have somehow been hitched up in the back, especially with the first and third women. Bingley’s citified and nouveau riche sisters were horrified at Elizabeth’s lack of decorum. To them, appearances are more important than sisterly devotion. One imagines that they would not have ventured out until the sun had dried the mud and they could be assured of a carriage. 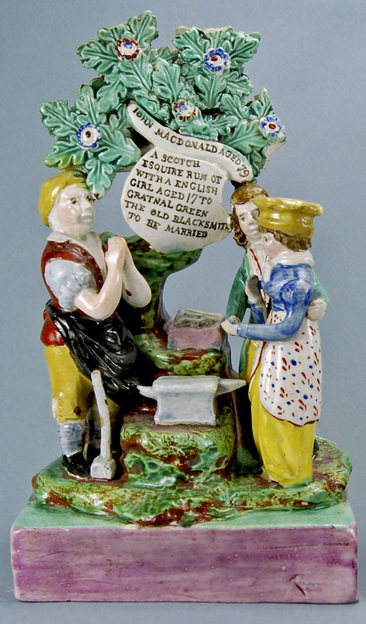 From the image below, one can readily see why Elizabeth’s hems were in such sad shape after her long walk in fields made wet by heavy rain. 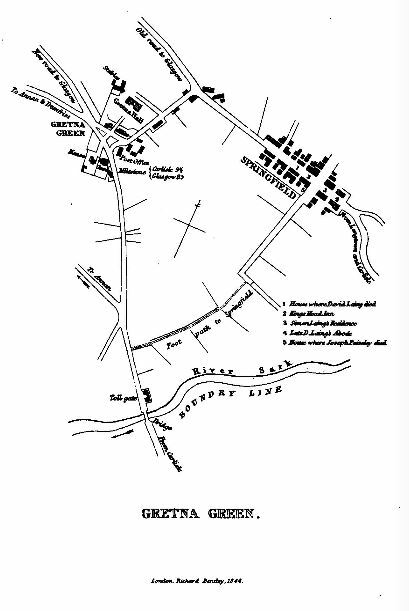 One wonders how helpful pattens were when dirt roads became quagmires. Although she was young when she painted these watercolours, Diana Sperling demonstrates a decided sense of humor in her paintings. In Northanger Abbey, Isabella and Catherine became quickly inseparable, even calling each other by their first names in an age when only intimate friends and family could be on such terms. They called each other by their Christian name, were always arm in arm when they walked, pinned up each other’s train for the dance, and were not to be divided in the set; and if a rainy morning deprived them of other enjoyments, they were still resolute in meeting in defiance of wet and dirt, and shut themselves up, to read novels together. They pinned up the trains of each others’ evening gowns to prevent tripping, but also staining, I suspect. (It must be noted that guests changed from their street shoes to dancing slippers before entering a ballroom, which probably reduced the amount of dirt trailed inside.) Nothing could stop the girls from seeing each other, not even “dirt” or muddy streets. There were many ways to protect trains. In this film still, Gwynneth Paltrow’s Emma hitches her train on a loop over her wrist. 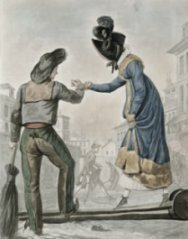 These French images from the late 18th century provide the best evidence in how ladies would protect their delicate dresses out of doors. 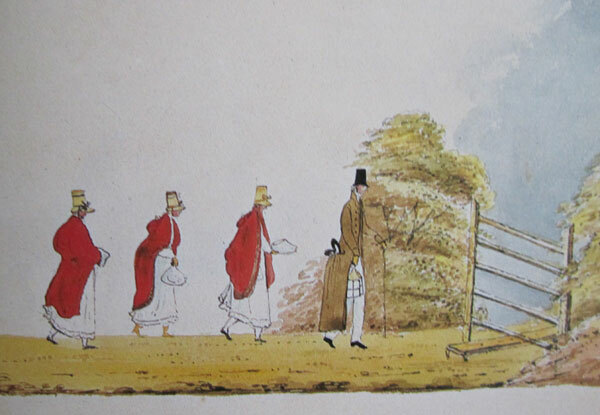 While we assume that ladies did not expose their ankles to the public (they certainly did not in the Victorian era, but the Regency was a different time), the illustrations point out the practical habit of hitching a train over one’s arm. 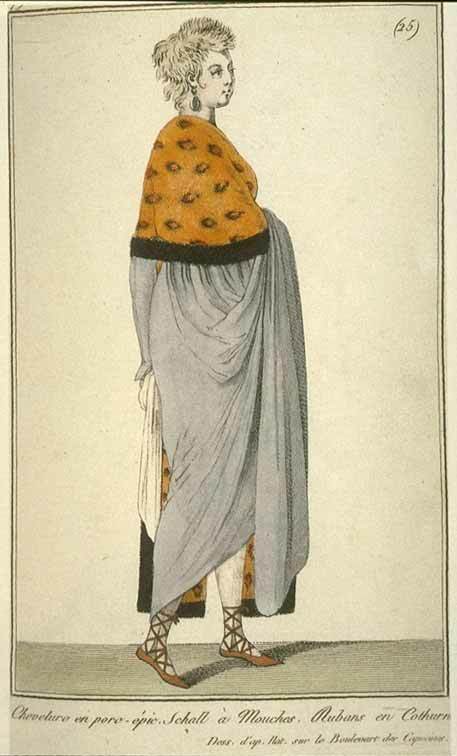 This French fashionista with her short, pert hair cut, reveals her roman style slippers as she promenades with her train carried over her arm. 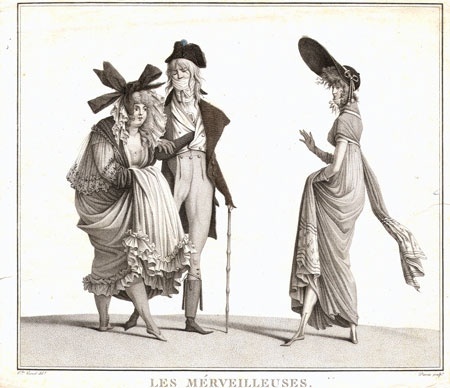 While this 1797 satiric image by Carle Vernet is making fun of fashionistas, one can surmise that the habit of carrying long skirts over the fore arm was widespread. Wind and open windows swept dirt and dust continually into houses and visitors trod in dirt. No wonder maids needed to sweep floors daily! Regardless of the efforts to keep streets, sidewalks, and floors clean, one wonders about the condition of the hems on women’s garments. Clothes were expensive before the advent of mass-produced cloth and were carefully recycled, even by the well-off. 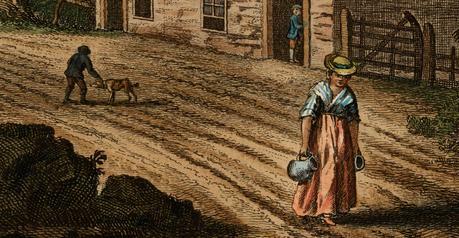 Laundresses took an enormous amount of effort to keep clothes clean. One can only assume that the majority of women wore clothes with stained hems, and that only the rich could afford the expense of keeping their clothes looking spotless. Eleanor Tilney wore only white gowns, which told contemporary readers more about her economic status than pages of explanations ever could. In Mansfield Park, Mrs. Norris frowned on maidservants wearing white gowns. These white clothes were not only above their stations, but they would require an enormous amount of time spent on maintenance.